Larry Munson, legendary radio voice of the University of Georgia Bulldogs, may be retired. But he will always be part of the Bulldog folklore. 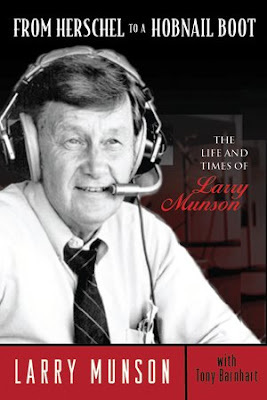 His autobiography, From Herschel to a Hobnail Boot: The Life and Times of Larry Munson , comes out next month. For 43 years (1966–2008) Larry Munson was the legendary football radio voice for the University of Georgia Bulldogs. But on September 22, 2008, at the age of 86, Larry announced that it was time to step aside from the one job he loved more than any other in his remarkable career. For decades publishers have been trying to get Larry to write a book about his life. He always declined, saying he had neither the time nor the patience and even asking, “Who would care?” Well, college football fans everywhere care, and today they are celebrating because Larry is finally ready to tell his incredible story. We will publish a review of this book when it does come out from Triumph Books.